Are you ready for a change? Tired of the way things are going? Have you just accepted some things will not change? Well, if you are a Christian you don’t have to settle for less than all God has promised in His word! We are Kings and priests to God! We are ambassadors of Christ. We are more than conquerors through Christ Jesus our Lord. Luke 10:19-20 — Behold, I give you the authority to trample on serpents and scorpions, and over all the power of the enemy, and nothing shall by any means hurt you. Nevertheless do not rejoice in this, that the spirits are subject to you, but rather rejoice because your names are written in heaven. I want to share a strange thing my husband, Lee saw on his way home from work a few months ago. He was driving and noticed a large bird with a baby bird in its mouth. Then he saw three birds flying after the bird that had the baby bird in it’s mouth. Those birds attacked the enemy bird and it dropped the baby bird out of its mouth. Then, the four birds flew away together! The birds didn’t just accept the fact that the baby bird had been taken and there was nothing they could do. Instead, they took action! They went after what was rightfully theirs! The mother bird took others with her to get her baby bird back. Its time for Christians to take back what’s the enemy has stolen. We don’t need to just accept it! We have the authority through the name of Jesus and the blood of Jesus! This a word I received from the Lord this week, and I wanted to share it with you. My word is mighty to the pulling down of strongholds. 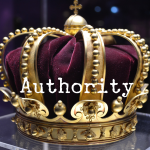 Take authority. Do not be passive. Take authority over everything in your house you belong to me. Your children belong to me. You’re heritage belongs to me. I’m not done yet. It’s only the beginning of what I have planned. New doors – new opportunities – new favor – new miracles – new BLESSINGS are coming! You will be amazed ! It’s time to take up the shield of faith and the sword of the Spirit. Take your place on the wall and take what is yours in the spirit! Everything will bow to the name of Jesus. Every spirit, every attack, every thought, every circumstance that has tried to take what is yours (what is God’s and what He has promised to you) will bow to the name of Jesus! Yes take it back! Don’t let it slide! Take authority in Jesus name and watch the transformation of every area of your life! I am sovereign and I will be exalted in your life. My glory will fill your life. Your life will glorify my name, and people will glorify me when they see my work in your life! It is me. I’m doing the work in you and through you. Take authority having full confidence and expectation that I will fulfill every word of my promise! Yes and amen! Have you been praying about something for a long time? I want to encourage you today to keep asking. Do not give up on the promises of God for your life! Pray until you get a breakthrough! Declare God’s word over your circumstances! Praise your way into victory! I was reading the story of Elisha and the Shunammite woman in 2 Kings 4:8-37. In the story the Shunammite woman was barren but Elisha prophesied she would have a son. When her son was a child, he suddenly became sick and died. Instead of just accepting this tragedy, the Shunammite woman laid her son on Elisha’s bed and ran to find Elisha. On her way there when anyone asked ‘Is it well with you?’ she replied ‘It is well’. She told Elisha that she would not leave him. I believe she would not take no for an answer. She was not going to accept this outcome as the final word on her promise; her son. Just like the Shunammite woman, you may feel like your promise has died or that it has taken so long to come that you feel like giving up. Well, I want to encourage you today to contend for the promise! Do not take less than what God has promised you! Jesus said in Matthew 7:7 Ask, and it will be given to you; seek, and you will find; knock, and it will be opened to you . I found it interesting that the Shunammite woman did not tell people her son had died. I believe that our words have power, and it is important to declare God’s word over our situation and not the enemy’s word. It is so easy to say negative things when we feel disappointed or feel that our promise is delayed or even hopeless, but determine today to only declare the word of God over your situation. Psalm 149:6 Let the high praises of God be in their mouth, and a two edged sword in their hand. I encourage you to praise and worship God. There is power and breakthrough in praise and worship! When you get into the presence of God, you are changed. Your focus is on Jesus. You get a new perspective. Praise is a weapon! It is powerful! Begin to worship and praise God until you get into His presence. He will refresh you and strengthen you in His presence. The Shunammite woman received her son healed and whole. He was raised from the dead! 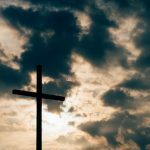 I believe that God is restoring your hope and expectation as you read this. Do not give up! Keep on asking, keep on seeking, keep on knocking! Your promise is coming! Keep contending for your promise! I want to encourage you today with this word from the Lord. It’s time for the people of God to take their place of authority. The time is now! We are seated with Jesus in heavenly places. Ephesians 2:6 For he raised us from the dead along with Christ and seated us with him in the heavenly realms because we are united with Christ Jesus. We are victorious through His blood and the word of our testimony! Say yes to what God is calling you to do. For such a time as this I have called you out to be a voice for me. Speak for me. Go for me. I go before you. It’s already done in the spirit! Walk in my love and declare it! I will show you great and mighty things that you have not known before. It’s time to step out. The harvest is ripe! The time is now! I’m calling you out to pray. Stand on the wall and contend for my presence. Watch what I do in response. Expect great and mighty wonders! Souls, miracles, healing, restoration, deliverance – it’s coming! Rise up! Step out! Speak my words! I will give you the land. Everywhere you step will be yours. 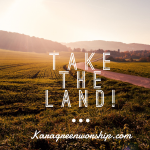 Take the land! Go boldly in JESUS name! Please leave a comment below if this word speaks to you.